Dehghani, E., Jabalameli, M., Pishvaee, M., Jabarzadeh, A. (2018). Integrating information of the efficient and anti-efficient frontiers in DEA analysis to assess location of solar plants: A case study in Iran. 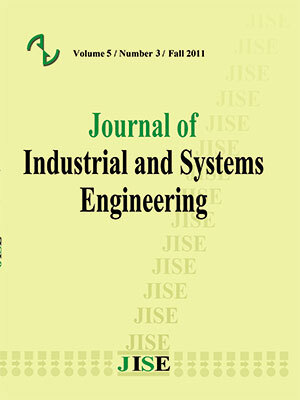 Journal of Industrial and Systems Engineering, 11(1), 163-179. Ehsan Dehghani; Mohammad Saeed Jabalameli; Mir Saman Pishvaee; Armin Jabarzadeh. "Integrating information of the efficient and anti-efficient frontiers in DEA analysis to assess location of solar plants: A case study in Iran". Journal of Industrial and Systems Engineering, 11, 1, 2018, 163-179. Dehghani, E., Jabalameli, M., Pishvaee, M., Jabarzadeh, A. (2018). 'Integrating information of the efficient and anti-efficient frontiers in DEA analysis to assess location of solar plants: A case study in Iran', Journal of Industrial and Systems Engineering, 11(1), pp. 163-179. Dehghani, E., Jabalameli, M., Pishvaee, M., Jabarzadeh, A. Integrating information of the efficient and anti-efficient frontiers in DEA analysis to assess location of solar plants: A case study in Iran. Journal of Industrial and Systems Engineering, 2018; 11(1): 163-179. The solar photovoltaic (PV) energy is one of the most promising sources of energy, which has attracted many interests. Itis potentially the largest source of energy in the world and is capable to mitigategreenhouse gas (GHG) emissions significantly in comparison with fossil fuels.Location optimization of solar plants can play a vital role to rise the efficiency and performance of the solar PV systems. In this regard, this study aims at evaluating different areas for solar plants according to a set of social, geographical and technical criteria through adata envelopment analysis (DEA) model. The proposed DEA model considers both information of the efficient and anti-efficient frontiers in order to rise discrimination power in DEA analysis. The proposed approach is evaluated and validated via studying a real case study in Iran. The extracted results reveal the usefulness and applicability of the proposed DEA model in choosing appropriate locations for solar plants. Allen, R., Athanassopoulos, A., Dyson, R. G., and Thanassoulis, E. (1997). Weights restrictions and value judgements in data envelopment analysis: evolution, development and future directions. Annals of Operations Research 73, 13-34. Andersen, P., and Petersen, N. C. (1993). A procedure for ranking efficient units in data envelopment analysis. Management science 39, 1261-1264. Azadeh, A., Ghaderi, S., and Maghsoudi, A. (2008). Location optimization of solar plants by an integrated hierarchical DEA PCA approach. Energy Policy 36, 3993-4004. Azadeh, A., Sheikhalishahi, M., and Asadzadeh, S. (2011). A flexible neural network-fuzzy data envelopment analysis approach for location optimization of solar plants with uncertainty and complexity. Renewable energy 36, 3394-3401. Babazadeh, R., Razmi, J., and Pishvaee, M. S. (2016). Sustainable cultivation location optimization of the Jatropha curcas L. under uncertainty: A unified fuzzy data envelopment analysis approach. Measurement 89, 252-260. Babazadeh, R., Razmi, J., Rabbani, M., and Pishvaee, M. S. (2015). An integrated data envelopment analysis–mathematical programming approach to strategic biodiesel supply chain network design problem. Journal of Cleaner Production. Banker, R. D. (1984). Estimating most productive scale size using data envelopment analysis. European Journal of Operational Research 17, 35-44. Banker, R. D., and Chang, H. (2006). The super-efficiency procedure for outlier identification, not for ranking efficient units. European Journal of Operational Research 175, 1311-1320. Bazilian, M., Onyeji, I., Liebreich, M., MacGill, I., Chase, J., Shah, J., Gielen, D., Arent, D., Landfear, D., and Zhengrong, S. (2013). Re-considering the economics of photovoltaic power. Renewable Energy 53, 329-338. Charnes, A., Cooper, W. W., and Rhodes, E. (1978). Measuring the efficiency of decision making units. European journal of operational research 2, 429-444. Chen, C.-R., Huang, C.-C., and Tsuei, H.-J. (2014). A hybrid MCDM model for improving GIS-based solar farms site selection. International Journal of Photoenergy 2014. Desideri, U., Proietti, S., Zepparelli, F., Sdringola, P., and Bini, S. (2012). Life Cycle Assessment of a ground-mounted 1778kW p photovoltaic plant and comparison with traditional energy production systems. Applied Energy 97, 930-943. Doyle, J., and Green, R. (1994). Efficiency and cross-efficiency in DEA: Derivations, meanings and uses. Journal of the operational research society 45, 567-578. Farrell, M. J. (1957). The measurement of productive efficiency. Journal of the Royal Statistical Society. Series A (General) 120, 253-290. Jun, D., Tian-tian, F., Yi-sheng, Y., and Yu, M. (2014). Macro-site selection of wind/solar hybrid power station based on ELECTRE-II. Renewable and Sustainable Energy Reviews 35, 194-204. Kengpol, A., Rontlaong, P., and Tuominen, M. (2013). A decision support system for selection of solar power plant locations by applying fuzzy AHP and topsis: An empirical study. Paradi, J. C., Asmild, M., and Simak, P. C. (2004). Using DEA and worst practice DEA in credit risk evaluation. Journal of Productivity Analysis 21, 153-165. Sabo, M. L., Mariun, N., Hizam, H., Radzi, M. A. M., and Zakaria, A. (2016). Spatial energy predictions from large-scale photovoltaic power plants located in optimal sites and connected to a smart grid in Peninsular Malaysia. Renewable and Sustainable Energy Reviews 66, 79-94. Sánchez-Lozano, J., García-Cascales, M., and Lamata, M. (2016). Comparative TOPSIS-ELECTRE TRI methods for optimal sites for photovoltaic solar farms. Case study in Spain. Journal of Cleaner Production 127, 387-398. Sexton, T. R., Silkman, R. H., and Hogan, A. J. (1986). Data envelopment analysis: Critique and extensions. New Directions for Program Evaluation 1986, 73-105. Shen, W.-f., Zhang, D.-q., Liu, W.-b., and Yang, G.-l. (2016). Increasing discrimination of DEA evaluation by utilizing distances to anti-efficient DEA frontiers. Computers & Operations Research 75, 163-173. Sheskin, D. J. (2003). "Handbook of parametric and nonparametric statistical procedures," crc Press. Sueyoshi, T., and Goto, M. (2011). Measurement of Returns to Scale and Damages to Scale for DEA-based operational and environmental assessment: How to manage desirable (good) and undesirable (bad) outputs? European Journal of Operational Research 211, 76-89. Sueyoshi, T., and Goto, M. (2014). Photovoltaic power stations in Germany and the United States: A comparative study by data envelopment analysis. Energy Economics 42, 271-288. Thanassoulis, E., Portela, M. C., and Allen, R. (2004). Incorporating value judgments in DEA. In "Handbook on data envelopment analysis", pp. 99-138. Springer. Wu, Y., Hu, Y., Xiao, X., and Mao, C. (2016). Efficiency assessment of wind farms in China using two-stage data envelopment analysis. Energy Conversion and Management 123, 46-55. Yamada, Y., Matsui, T., and Sugiyama, M. (1994). An inefficiency measurement method for management systems. Journal of Operations Research Society of Japan 37, 158-168. Yokota, S., and Kumano, T. (2013). Mega‐solar optimal allocation using data envelopment analysis. Electrical Engineering in Japan 183, 24-32. Zhang, D., Li, X., Meng, W., and Liu, W. (2009). Measuring the performance of nations at the Olympic Games using DEA models with different preferences. Journal of the Operational Research Society 60, 983-990.